Following the country-wide anti-Tamil pogrom in 1983, the group of soldiers of the Sri Lanka Navy stationed in the Naval Headquarters went berserk one night in the Trincomalee town, and burnt shops and houses belonging to Tamils. They burnt down the chariot and its parking structure of the Sivan Temple. Since then, the Chariot festival in the temple is held using an improvised structure called "Kattuther " during its annual festival at the conclusion of the ten-day Thiruvembavai pooja. The damaged parking structure of the chariot has not been rebuilt. Temple authorities have taken steps to build a new chariot according to Hindu scriptures. Lord Nadesar being brought in procession in improvised structure called "Kattuther". A portion of the destroyed structure for parking the chariot is seen close by. The chariot was completely burnt down by the SLN soldiers in July 1983. Thiruvembavai is a ten-day worship for Lord Siva and his consort, Goddess Shakthi. One of the four Saiva saints, Manickavasagar Swamigal, had composed the twenty hymns known as Thiruvembavai, and it is sung in all Sivan temples during the month of "Maarkali" in the Tamil calendar, which falls between the latter part of December and the early part of January. Thousands of Hindu devotees Wednesday morning thronged the Sivan temples in the NorthEast province and worshipped Lord Shiva and Goddess Shakthi on the final day of Thiruvembavai pooja. 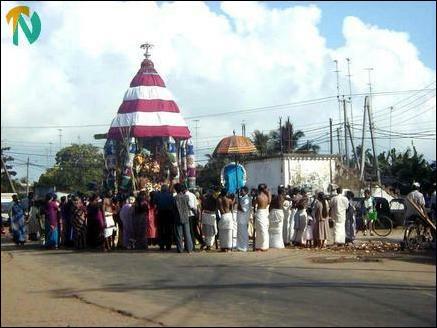 The chariot festival was held in all Sivan temples with the statue of Lord Nadesar being taken in procession. 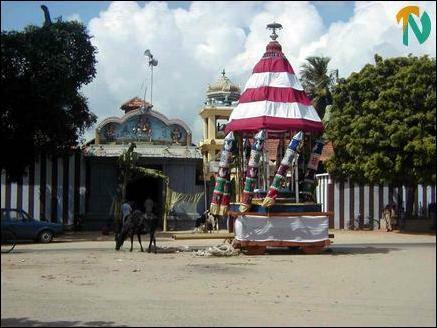 The "Kattuther" is seen in front of the Trincomalee Sivan Temple after the festival.